Throughout the fall 2017 semester I spent quite some time looking into internships for the spring. I was not having much luck finding anything that interested me until Denise Bookwalter, the founder of Small Craft Advisory Press (SCAP) and the head of the printmaking department, contacted me and presented me with the opportunity to do an internship at SCAP. Though I had previously considered taking classes in book arts, I never got the chance to. My experience this semester, as an intern at SCAP has been incredibly valuable. I came to FSU not knowing printmaking and book arts even existed. Two years later, I am graduating with a BA in studio art with a focus in drawing, painting, printmaking and knowledge of book arts. During my time as an intern at SCAP, I have learned letterpress, a variety of binding techniques, as well as other random bits that have helped me in my own studio practice. Recently, I made my own artist’s book, which I would like to make a small edition of in the future. 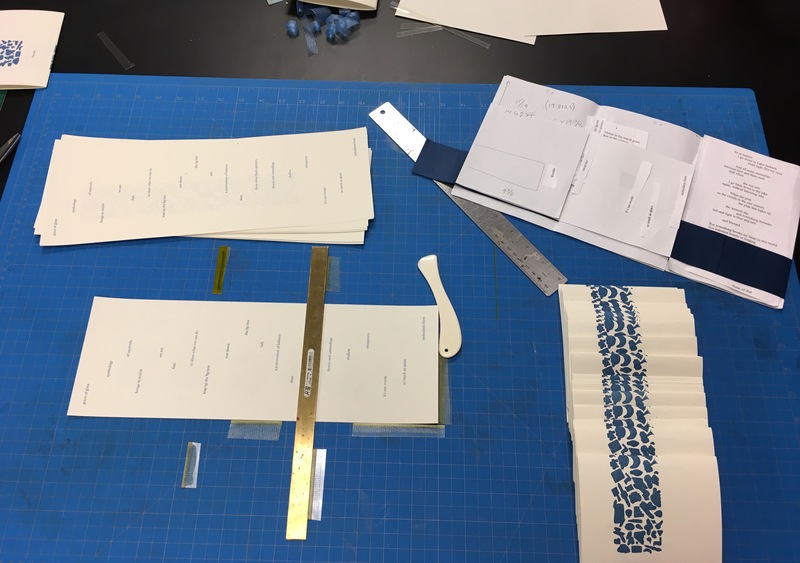 SCAP has also provided me with the opportunity to collaborate on a book with poet Michael Rothenberg and Kacee Reguera, another student who is also a current intern at SCAP, as part of a series of artist’s books called Oyster Boat. Oyster Boat turns drafts and leftovers into paperback artist’s books, and relies heavily on collaboration. Over the course of the semester I have worked on a few Oyster Boat books, helping to print and bind them, and have seen them at various stages of completion. The process and final result for each one is incredibly different. In our own Oyster Boat book, Kacee and I have taken excerpts from Michael Rothenberg’s poem, “On Lake Jackson” and captured the essence of the poem, while also making the book personal to us. This experience has taught me about collaboration, what it is like to produce a book from start to finish and a variety of ways to approach making artist’s books. I have enjoyed my internship at SCAP so much, I have been looking into print shops I could work at after graduation. I have also considered going to graduate school for printmaking or book arts in the future. I am very grateful for this internship, as well as the opportunity to work with Denise Bookwalter and Elysia Mann, the press manager at SCAP. Thanks to them, I am graduating with more knowledge in printmaking and book arts than I ever expected to have.